Founded in 1884 as a single market stall in Leeds, Marks and Spencer has grown to be one of the UK's largest and best-loved high street brands. With over 900 stores across the country offering everything from food and drink to clothes and home furnishings, you're sure to find something you'll love. 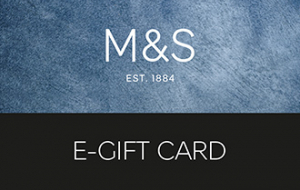 Your M&S e-gift card can be redeemed at Marks & Spencer stores (including M&S Outlets, railway, motorway and airport stores, in the United Kingdom. Simply print out the e-gift card and present at the till or scan the bar code at self check-out. For your convenience your e-gift card can be cut out and stored in your wallet. Your e-gift card can also be spent online by entering the 16 digit card number and PIN at the checkout. Please select the gift card option at payment.